6 11" x 16" unmounted (light cardstock/heavy paper) geoboards (A, B, C, D, E, F), 4 large of overlays (53 overlays total), 4 scenarios on cardstock, 88 die-cut counters. Lords of the Steppe (hereinafter Lords) is a Critical Hit ASL product that is very instructive. It is an example of Critical Hit taking an interesting idea and making it less useful, and of promising far more in a product that is likely to be delivered. For this, it charges $69.95. 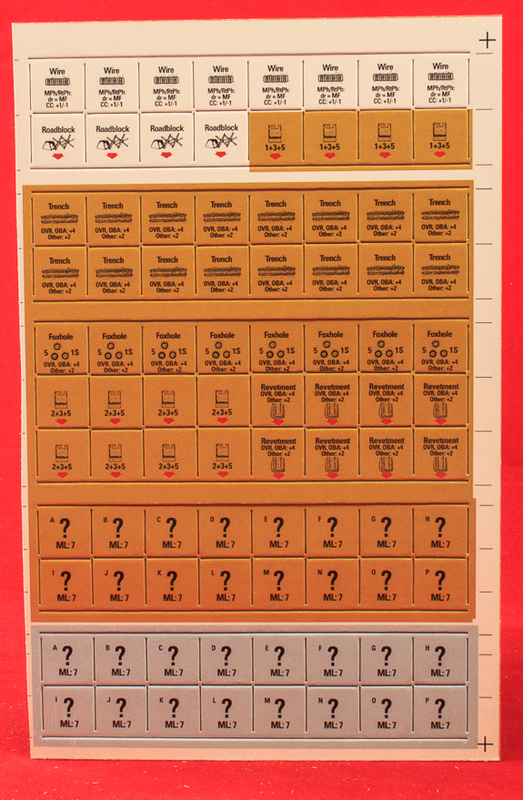 Lords originated as an ATS product but was easily converted to ASL as it really consists of geoboards and overlays (it has some scenarios and counters, but see below). In ASL, Avalon Hill debuted the “Desert Theater of Operation” or DTO with the product West of Alamein. Designed to represent the mostly flat desert surfaces of North Africa, the product included a series of “desert” geoboards. These were 8″ x 22″ geoboards with a sort of generic sandy/rocky desert terrain printed on them. Though they were not identical, they were not particularly distinguishable from each other, either, and desert scenarios essentially relied on a large number of overlays to represent departures from flat ground such as hammadas, dunes, deirs, hills, and the like. ASL, in its infinite wisdom, decreed as well that these boards could serve as boards for “steppe terrain,” the vast flat grasslands that can be found from southern Russia all the way to Mongolia. That was fine for parts of the “steppe” that were desert-ish, but to use desert geoboards for the lush green grasslands that is typical of much steppe terrain created a sort of painful cognitive dissonance. The boards simply didn’t look like the steppe. As a result, some ASLers did not like playing steppe scenarios, since it was too difficult to suspend their disbelief and/or to suppress their dislike. 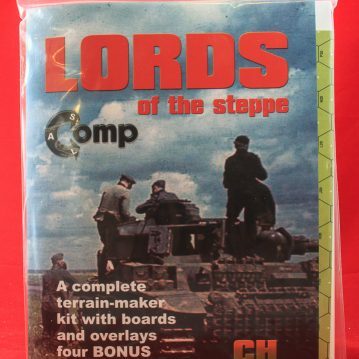 In the years since, semi-regular calls have been issued from one or another part of the ASL world for Avalon Hill, then later MMP, to come out with some actual steppe terrain boards. Given that relatively few steppe scenarios actually exist, this has not been any sort of priority or interest for MMP. Into the steppe arena steps Critical Hit with Lords of the Steppe. Has Critical Hit come to save the day? Well, umm, sadly, the answer is no. Lords consists of 6 11″ x 16″ (light cardstock or heavy paper) unmounted geoboards (A, B, C, D, E, F) that purport to offer steppe terrain, as well as 53 overlays of varying sizes to accompany and be used on the geoboards. The boards themselves are distinguished by letter for the sake of convenience but in fact are all copies of the same board. 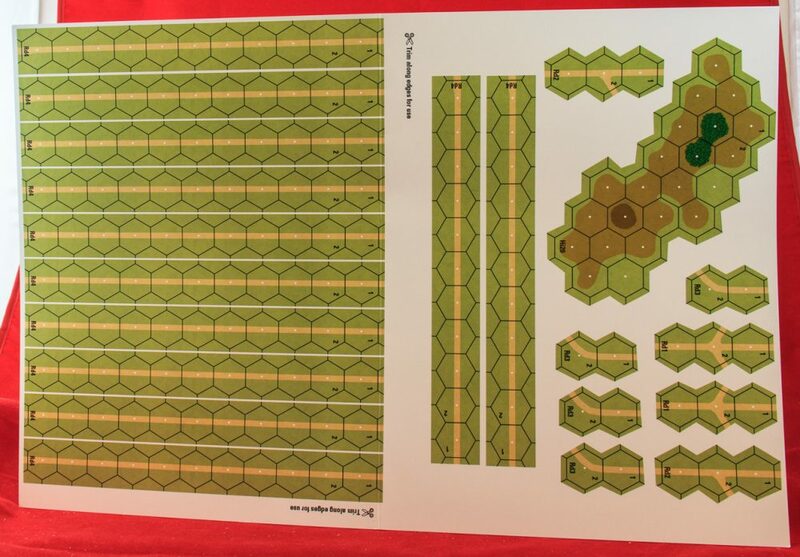 And the board that supposedly represents steppe terrain is nothing but a plain, blank green area overlaid by a hex grid. There is no actual artwork, no textures, no shading or shadows, no hints of grass. Just a big undifferentiated square of green. And a hexgrid. The lack of effort here is particularly sad, as even a little bit of effort could have created some very interesting geoboards. One suspects that Le Franc Tireur, had it handled this project, would have come up with more interesting-looking boards. 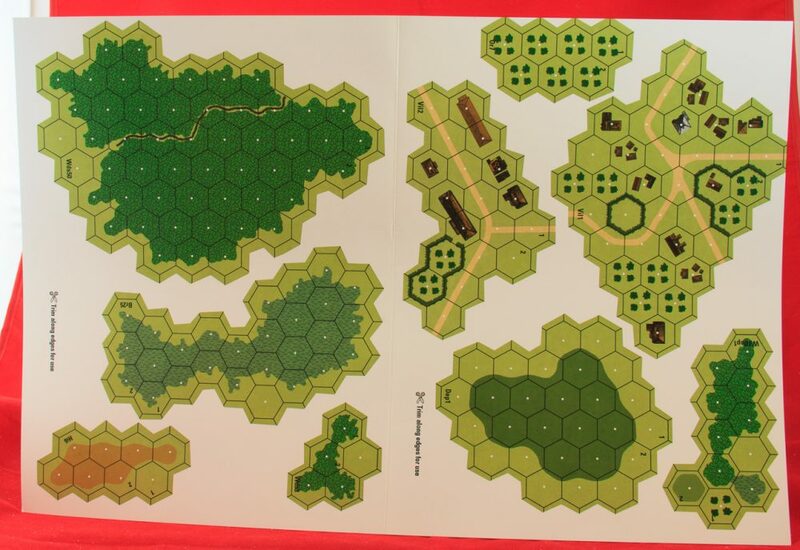 Critical Hit marketing copy breathlessly exclaims that the boards can be put together to “form one EVEN LARGER linkable map–and can be expanded infinitely.” Umm, yeah, that’s called geomorphic mapboards and ASL has had those since before there was even ASL. The whole idea of ASL boards is that you can put any number of them together to form a big board or a bigger board or a big bigass biggest board. This statement was sort of like saying “We’ve invented this thing called counters and they can represent MEN or TANKS or even INFORMATION like ‘prep fire. '” Yeah, hate to break it to you, breathless Critical Hit spokesperson, but that’s been done before. Way before. The main problem with Critical Hit’s steppe geoboards is that they are all 11″ x 16″. About two years prior the writing of this piece, Critical Hit decided to switch from providing 8″ x 22″ geoboards to providing 11″ x 16’ geoboards. 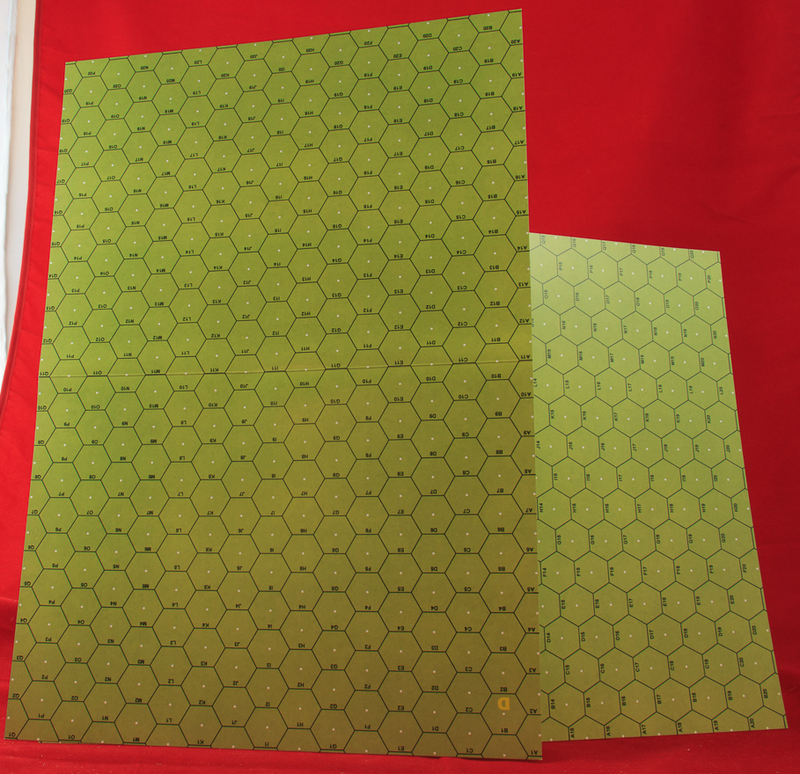 Critical Hit’s geoboards could not be printed on one sheet of paper or cardstock but rather had to be divided between two 9″ x 12″ sheets, with players having to cut away the excess white. So this was a bit expensive and players did not like the extra work. But Critical Hit found that it could print 11″ x 16″ boards as one piece, not divided between two, which saved money and solved a bunch of problems for them. Ever since then, they have been printing 11″ x 16″ boards, even going to the extent of creating new such boards to replace 8″ x 22″ boards in some of their previous projects. So far so good. 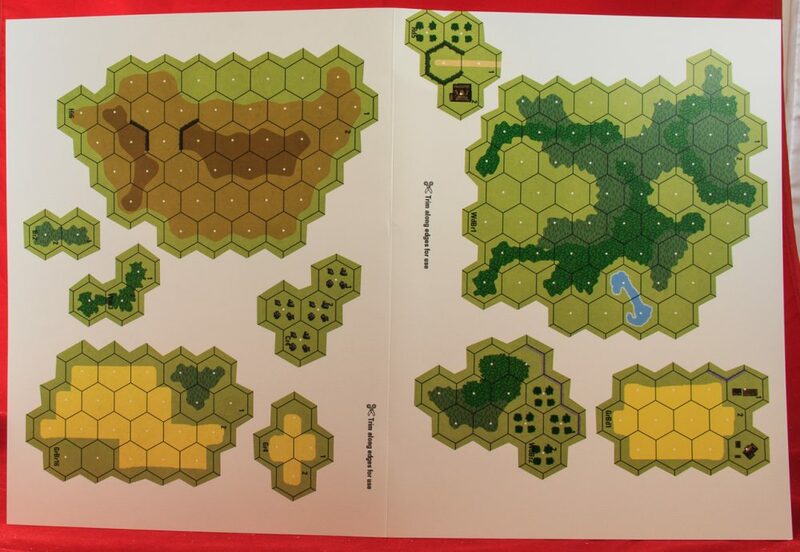 But there is not a single ASL scenario, as of this writing, that uses steppe terrain and takes place on 11″ x 16″ boards. They all use the 8″ x 22″ desert boards. 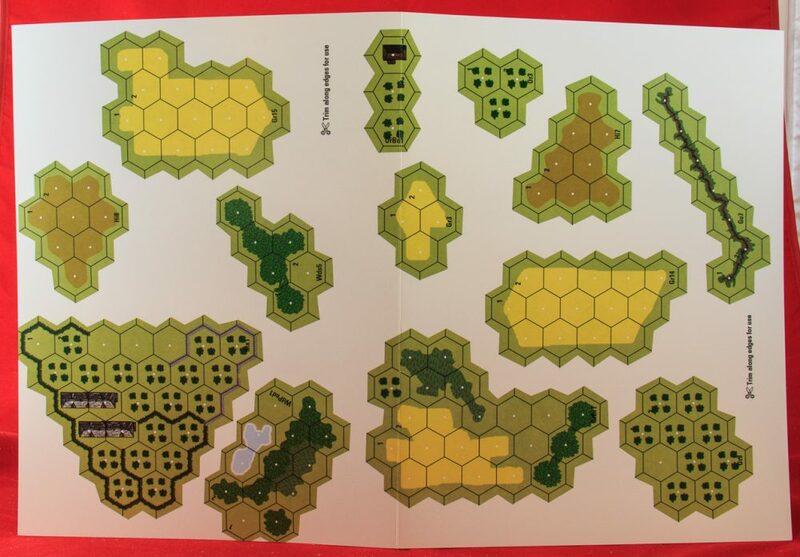 So these Lord boards cannot be used for ASL steppe scenarios unless players count up the number of hexrows used on those scenarios and assemble enough Lord boards to create an equivalent-sized playing area, perhaps marking off out of play areas. Very inconvenient at best. The result is that the boards are really only useful for the few scenarios included in Lords (see below), as well as DYO efforts. And, dirty little secret revealed, most ASL players don’t do DYO. This would not be as big a problem if Critical Hit would provide consistent follow-through and support these boards with future new steppe scenarios that could use the terrain. Now, in its marketing copy, Critical Hit promises that there is “much more to come,” which may mean that more boards and sets of overlays will be released, but scenarios, if any, are likely to be similar to the ones described below, and equally few in number, which does not create a very hopeful situation. And to dash cold water on even those tiny wisps of hope, the entire history of the company known as Critical Hit is that it does NOT continue to support such products once they’ve been published but in fact typically abandons them after a year or two, never to refer to them again. To lay this out in stark terms, this means that unless you are heavily into DYO, your odds of getting reasonable mounts of play value out of this product are actually pretty low. And that is unfortunate. But let’s put that aside and continue the content analysis. The overlays are pretty basic but attractive enough, and consist of the usual array of woods and orchards and little blocks of buildings and so forth. Nothing special but certainly nothing to complain about. 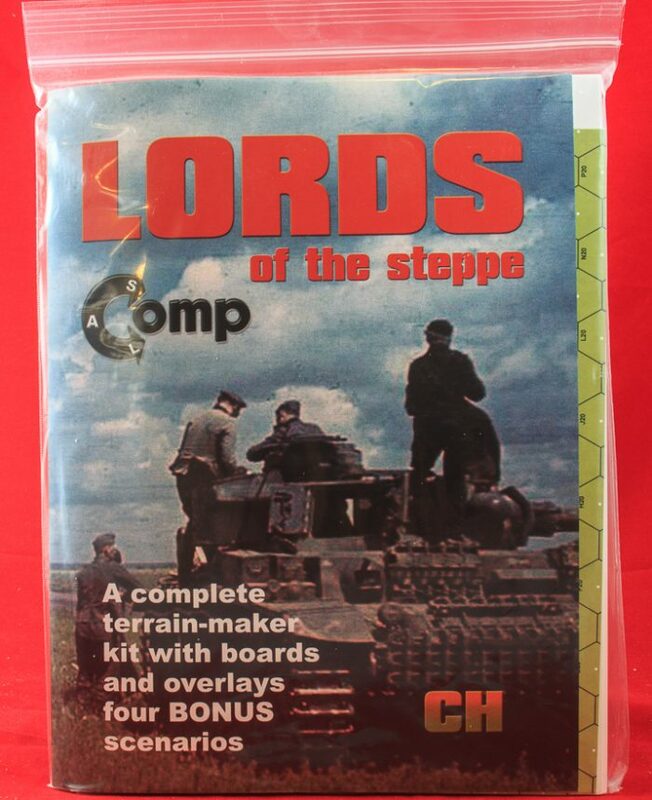 Lords comes with a half-countersheet of 88 5/8″ counters, but they were presumably thrown in just so the product could have counters, as they consist of nothing but concealment markers, pill boxes, and other standard fortifications. The four “bonus” scenarios are East Front actions from 1941-1943. For some reason, none of the scenarios specify that Steppe terrain is in effect. When Critical Hit says a scenario is a “bonus” scenario, that typically means it is not an original scenario but is a reprint of some older scenario that was just thrown into a product. 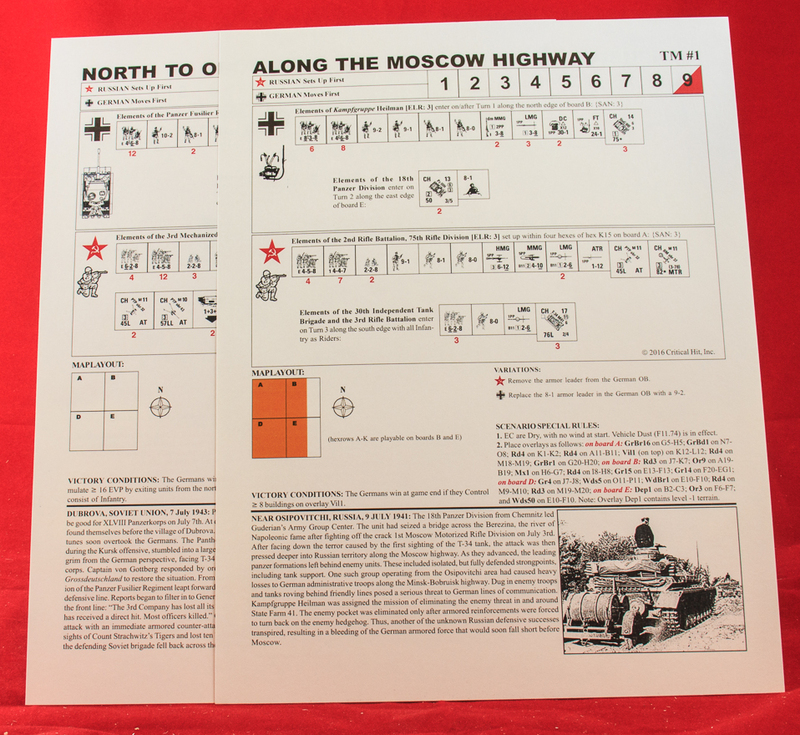 TM1 (Along the Moscow Highway) was originally ASLN31 (State Farm 41), originally published in the ASL News newsletter and reprinted by Critical Hit in Scroungin’ ASL News. It is worth nothing that the place where this action takes place is not in southern Russia and is not actually steppe terrain. TM2 (Confusion at Djergljetz) was originally ASLN37 (A Bush Across the Street), similarly previously printed in Scroungin’ ASL News. This scenario actually takes place near Leningrad and thus is not within hundreds of miles of steppe terrain. Note that right around the same time Critical Hit cannibalized this scenario for Lords, it also cannibalized it for Turret-Makers: Russian 41-45, which is ballsy even for Critical Hit. TM3 (Fall Wirblewind) was originally PB-CH(B) (Powderworks), appearing in Critical Hit Magazine Volume 4, Number 2 some 20 years ago. It is another scenario that did not actually take place on the steppe. TM4 (North to Oboyan) was originally OAF2 (Tiger’s Roar), an old On All Fronts newsletter scenario that Critical Hit reprinted in OAF Pack 1. Amazingly, Critical Hit also cannibalized this scenario for Lend-Lease Set 1 at around the same time! Thus someone who had purchased all the recently-released Critical Hit products would have actually several times been purchasing the same scenario more than once. At least this scenario, set around Kursk, was in the area of some steppe-like terrain. It is important to note that there is no evidence any of these scenarios were replaytested for their new terrain configurations, even though they would need to be. This renders the value of these scenarios considerably less. All things considered, this product is only of value for players who are really into DYO or players who believe, against all odds, that Critical Hit will continue to support this product with a string of new scenarios in the years to come. Good luck with that.